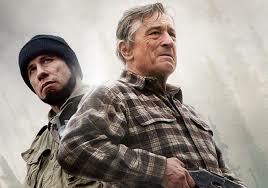 Directed by Mark Steven Johnson in 2013, Killing Season stars Robert De Niro, John Travolta and Milo Ventimiglia. This thriller pits two veterans of the Bosnian war (de Niro and Travolta) in a cat-and-mouse game set in the unforgiving Appalachian Mountains. In present day Belgrade, Serbia, former Scorpions soldier Emil Kovač (Travolta), who survived the shootings, meets his informant to retrieve a file on American military veteran and former NATO operative Colonel Benjamin Ford (De Niro).